Laminate is all we do. Hallmark has served the building and remodeling industries since 1954 and has grown to be Baltimore's premiere custom laminate shop. 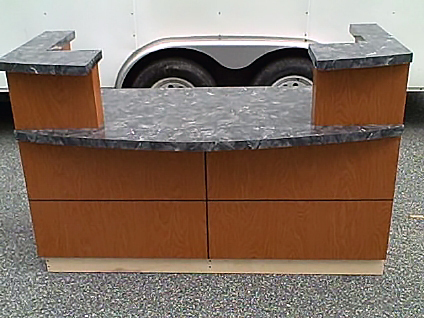 We fabricate self edge, crescent edge and bevel edge laminate countertops in 8 business days or less. Laminate is all we do so you're sure to get the best quality and craftsmanship. 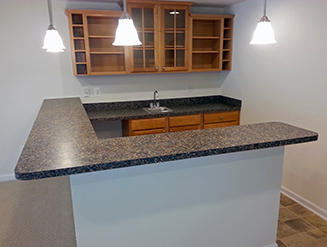 We provide countertop fabrication services for Kitchen Countertops, Bathroom Vanities, Laminate Counters for Residential & Commercial Uses, Hotels, Motels, Offices, Hospitals, Educational Facilites, Apartment Buildings, Condominium Buildings, etc. Our professional expertise will guide you in choosing the right combination of features, materials, colors, shapes, and textures that will make your home or office products unique. Listening to your ideas and communicating with you is very important to us in creating and fabricating your products. Our Baltimore showroom is where you can see and touch all available laminate types and edges. Look into our shop, (through the fishbowl) and see how a custom countertop is made. We fabricate all items in house. We do not subcontract any fabrication. 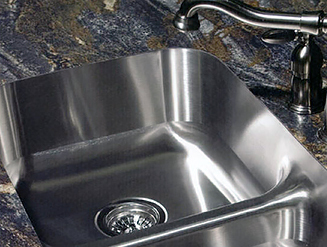 Once all details are finalized, you will see your countertops in 8 business days or less. That simple ...no need to deal with a depot! We invite you to visit our Baltimore Showroom & Manufacturing Facility at 6318 Falls Road. Can't make the trip? Please fill out our General Contact Form below and someone from our team will be in touch with you shortly! Ready to be a Hallmark Countertops customer? Please fill out our Customer Request Form.